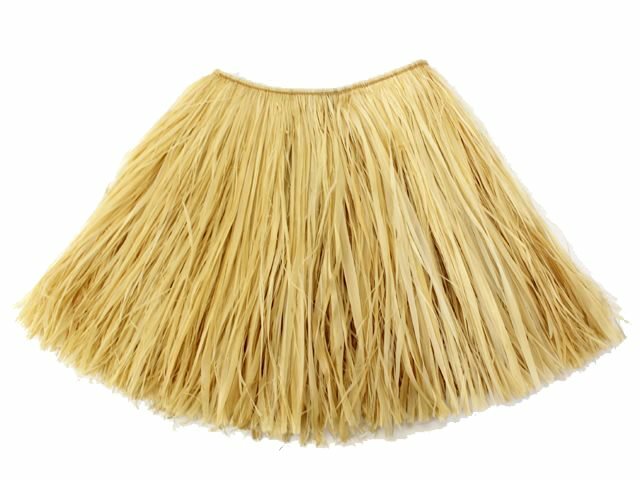 The Fringe Skirt is used for various purposes: Tahitian costumes (skirt), Ceremonial head-dress, and cape. When used as a skirt, a cord is attached to fasten it around your waist. The Tahitian Skirt comes in two length sizes, both at the same waist length. Natural, Bleach, Red, Pink, Yellow, Green, Blue, Purple, Orange, Brown, Black, Light Pink, Light Blue, Turquoise, Lime Green and Light Brown,Fuchsia,Ilima. *Colored Skirts are all hand-dyed, so we recommend ordering bulks at once for consistent coloring for Halau/group orders. *Manufacturing will take 3-4 weeks due to short supply. *Feel free to contact us to request a color not shown here. You can choose Fabric and Make your own original Tahitian Skirt Fringe (MORE) Cases ! Natural Raffia Ribbon 10Piece set 3"
Wonderful skirt! It provides excellent coverage, yet is not excessively heavy. Wore it all night and received many compliments!